©2017 Cummins Inc. Box 3005, Columbus, IN 47202-3005 U.S.A. Cummins X12 ™ For 2018. The Productivity Leader. 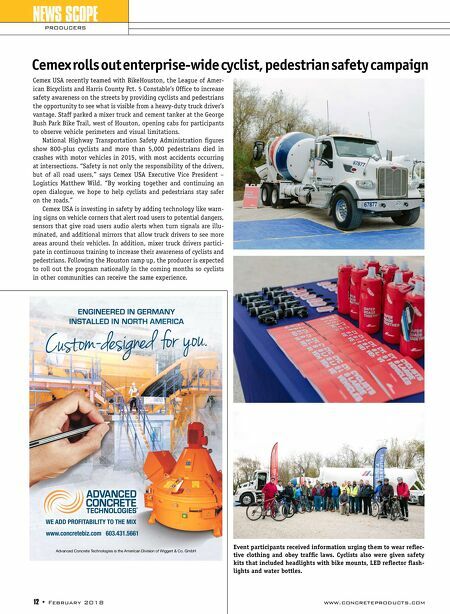 Meet the concrete industry's new heavy-duty power-to-weight leader. Cummins X12 kicks the competition to the curb, with up to 500 hp and 1700 lb-ft of peak torque in a package that tips the scales at just 2,050 pounds. That's 150 pounds less than the next-closest competitive engine and up to 600 pounds lighter than other medium-bore engines. Not only does the X12 deliver power and a bigger payload – the standard engine brake offers greater stopping power than the ISX12 across the board. The new Single Module ™ aftertreatment system is up to 40 percent lighter, and its compact size allows for more effi cient heat management and lower TCO. So you save on every yard you pour. Plus, you get the confi dence of knowing you're backed by the biggest, most capable service and support system in North America. 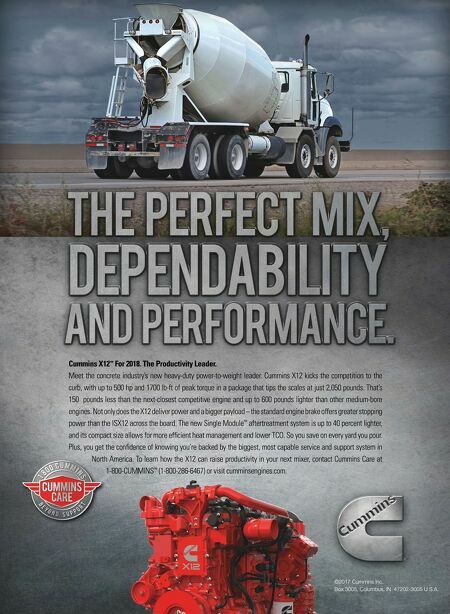 To learn how the X12 can raise productivity in your next mixer, contact Cummins Care at 1-800-CUMMINS ™ (1-800-286-6467) or visit cumminsengines.com.